Al Vermeil is the only strength coach to have World Championship rings from BOTH the NFL and the NBA. 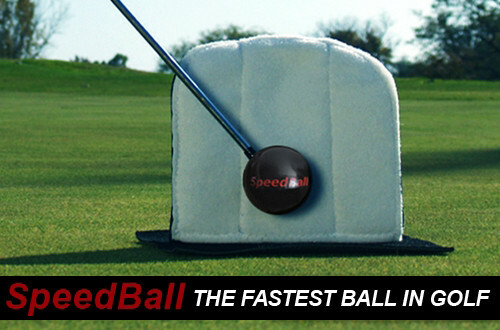 The SpeedBall® Kit contains the Striking Club, Impact Target, Base, and Instructional Videos. 1. Clubhead square at impact. 2. Clubhead moving down the target line at impact. The SpeedBall® uses a principle that we call FeedForward. FeedForward means that you learn the feeling of the correct movement through doing the action. How is this different from conventional training aids and video systems on the market today? Well, most just give you the results of the last swing that you took, or only work on one aspect of the swing. As many of you already know, those results that you get have totally nothing to do with acquiring the correct feeling for the right action. Just because you intellectually KNOW that you sliced the last shot, or that your takeaway was too much inside last time doesn’t mean that you can make the next one go straight. The current trend is video analysis is a good example of this. Much time is spent in analyzing exactly where every body part is at any particular point of the swing; but as golfers have found out, just knowing this information doesn’t mean we can change it. The reason that this information is totally useless as far as changing your swing is that it does absolutely nothing to give you the feeling of what you are trying to accomplish. The golfer’s lament – “I KNOW what I should be doing, I just can’t do it.” Bobby Jones stated that squaring the clubhead up at impact can only be achieved by our subconscious mind….which is programmed by our FeedForward principle. The beauty of the SpeedBall® System is that it ingrains into your subconscious mind two of the most important and difficult to learn essentials of the golf swing – (1) Squaring the face of the club up at impact, and (2) acceleration of the club at and thru impact. The basic system is composed of the Striking Club, Impact Target, Base, and Instructional Videos. 1. The Striking clubs are weighted the same, and have the same feel as a regular golf club. They come in mid-iron and driver sizes, both for men and women and are custom made for children. The clubhead is a ball that is divided into halves, one side white and the other black. The black side has a cross of Velcro Strips. The black side corresponds to the front of your clubface. 2. The Impact Target presents a one foot target that stands up from the floor. The face of it is covered with Velcro. You place the Impact Target on its Base. The idea is to swing thru the middle of the Impact Target and stick the Impact Target to the clubhead as it is swung to the finish. Made in the USA – The SpeedBall® is made entirely in the state of Kansas.